In this week’s edition of Weekend Watch, we’re celebrating the release of Star Wars: The Rise of Skywalker along with unpacking what the recent title reveal might imply. Starting off, we have a quick explainer video before going into an hour-long panel discussion on the film straight from this year’s Star Wars Celebration. Next, we’ll dig into some of the smaller details in the trailer that you might have missed, along with how the Death Star’s potential inclusion might factor into the plot. Finally, we’ll close things out with a lengthy discussion video that dives deep into the trailer and title reveal. Starting things off, we have a video from Top 10 Nerd that explains Star Wars: The Rise of Skywalker. Aside from the quick recap of events in the trailer, it also goes over some of the more obvious references and reveals. While there’s nothing earth-shattering here, it also serves as a great primer for those who need a bit of context. Next, we have the full panel for Star Wars: The Rise of Skywalker in its entirety from Star Wars Celebration 2019. In the hour-long video from Disneyland Experience, host Stephen Colbert joins director J.J. Abrams and producer Kathleen Kennedy for a wide-ranging discussion about the movie. While most of the cast eventually takes part in the panel, there are tons of little tidbits throughout. Even though everything is naturally spoiler-free, it’s just great to see the cast finally in one place. Towards the end, the panel also introduces a new droid in D-o (pronounced dio), as well as featuring the reveal of Ian McDiarmid on stage after debuting the trailer for the first time. 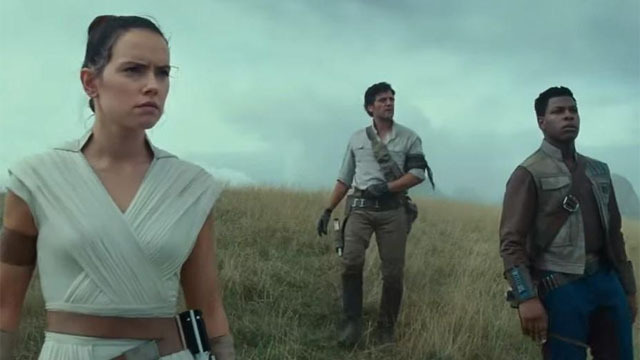 This video from Mr. Sunday Movies takes a look at some of the easy to miss details in the first teaser trailer for Star Wars: The Rise of Skywalker. After quickly recapping the troubled development history of the film, it quickly transitions to some of the apparent Easter eggs from the trailer. There’s naturally speculation for what the trailer might imply about the story throughout, it does a great job of trying to add some context to the new footage. The video also explores the ramifications for the title, Luke’s role in the film, as well as Palpatine’s apparent return and much more. Speaking of Palpatine’s return, we have a video from Generation Tech that takes a look at the feasibility of Darth Sidious being alive. Although this video spends a great deal of time unnecessarily bashing The Last Jedi, it eventually looks at Palpatine’s origins for clues to what is actually happening in Star Wars: The Rise of Skywalker. While it’s impossible for the video to draw a definite conclusion considering the lack of information about the plot, there are some decent theories presented here. Next, we have an interesting video from Star Wars Theory that tries to make sense of the final shot in the trailer with the remains of the Death Star. In one of the most perplexing questions that the trailer raises, this excellent video tries to give some context on what this might imply for the plot of Star Wars: The Rise of Skywalker. By using excised information and unused concept art from The Force Awakens, it’s able to shed some light on what our heroes might be doing returning to the remains. In what seems to be the second Death Star from the battle above Endor in Return of the Jedi, there are of course theories about what its inclusion implies for the story. Finally, we end things with a massive, nearly three hour discussion that comes from John Campea. After giving a recap/reaction to the panel and trailer above, we also get a nice summation of the many theories revolving around the title reveal. Afterward, the video relies mostly on fan questions/theories to fuel the discussion about the teaser trailer. Overall, this video does a great job of covering just about all the little details in the trailer that you could possibly imagine. It there’s anything to gain, it’s that there’s going to be tons of theorizing for the next eight months. What are your thoughts about this week’s videos? Make sure to let us know in the comment section below!